The Gypsy's Guide: Happy Halloween Michelangelo-Style! Happy Halloween! It's a day of ghosts and goblins... and Michelangelo? Yep. Michelangelo! Read on... and maybe get some costuming inspiration? "Finally, on October 31, 1512, the chapel’s doors were opened and Romans flocked to see the wonders therein. 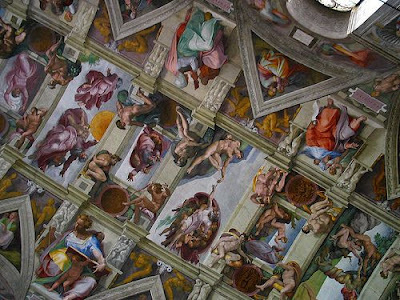 Michelangelo’s work created an immediate sensation in the city and beyond. In covering the enormous space with a program of panels and tremendous figures, Michelangelo had solved the problem of perspective that faces many muralists. The ceiling is impossible to see all at once, even though it soars sixty feet above the floor. No seat in the chapel has a better view than another—and all views are beautiful. "With Julius II’s death in 1513, Michelangelo could have been forgiven for thinking he would no longer be pestered by the pope about the Sistine Chapel. And, indeed, that was the case for no fewer than twenty-three years. But in 1536, he would be called back to the chapel again, this time to paint the altar wall for a very different kind of pope." Happy Halloween! I hope it is spooky! That is really cool! I did not know that the Sistine chapel was originally opened on October 31st! Good to know. In just 3 years from today it will be celebrating it's 500th birthday! Amazing! @Peter: You are exactly right! LOL It's the only one I have, I promise. I finally went to the Sistine Chapel this summer and was blown away! It was so massive and gorgeous. I was not pleased, however, that we were not permitted to take photos (even without flash). We were told that on some days they allow it, but on others they don't. I was there on the wrong day! But I couldn't leave without one, so I stuck in several no-flash pics. Couldn't help myself. It was astounding!